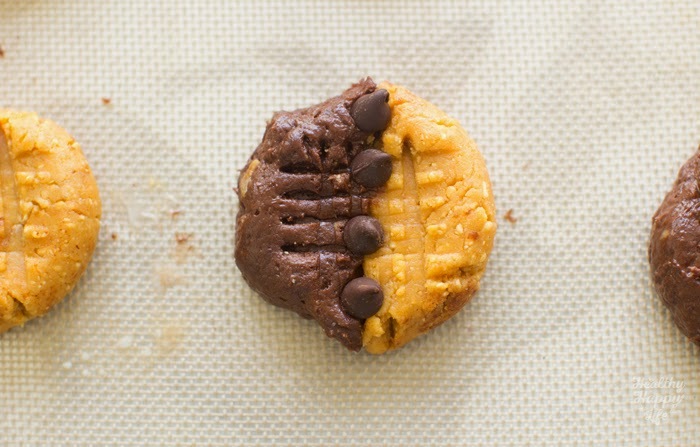 Half and Half Cookies: Peanut Butter Brownie. Vegan. Give these a try! Over the weekend, I was at ExpoWest. It was crazy! So many vegans there, and so many friendly faces offering samples of innovative, yummy, brand new and familiar natural foods brands. It was basically vegan heaven. But late Friday night, after an amazing dinner at Greenleaf restaurant (SO good! ), with my friend Cat of RabbitFoodForMyBunnyTeeth, craving something fun and sweet, we wandered over to Stax cookie bar in Irvine because they have vegan options. I have not been to a "cookie cafe" in ages, so I was excited to check them out. Freshly baked cookies: ya, OK, I guess. As I shuffled along in the line at Stax, loud club music pounding through the walls, freshly-baked cookie aromas wafting through the air, gliding from the ovens right behind the counter. 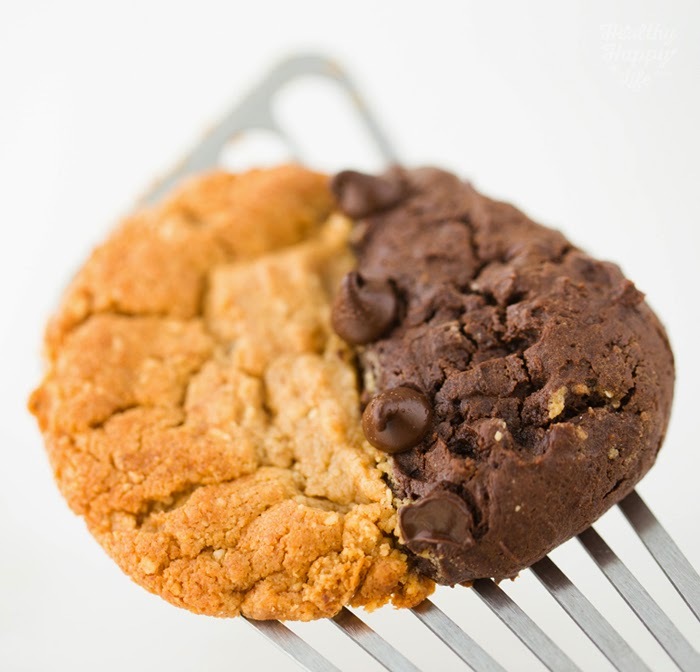 I noticed that one of the non-vegan cookie flavors was a half and half chocolate chip with a double chocolate cookie. It was perfectly "halved" and I was inspired. Must Veganize!! MrWhite scoping out these steamy, warm yummy cookies. So this was my FIRST attempt at half and half cookies. First. 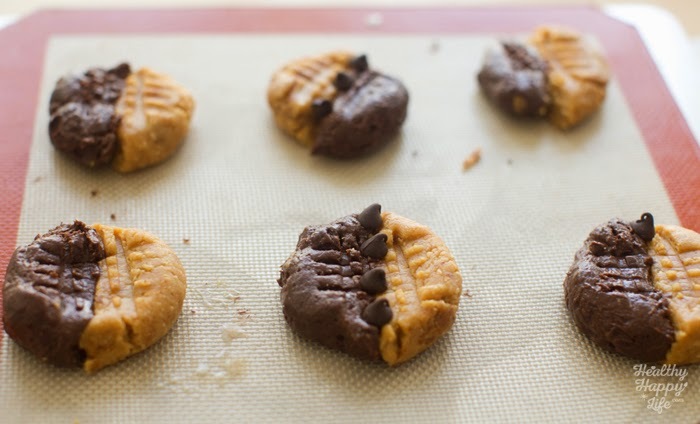 They are FAR from perfect and I have a few tweaks to make next time I try them, but still delicious, vegan and fun to attempt. And I wanted to share this fun idea with you guys, since half-n-half cookies can happen in so many flavors. 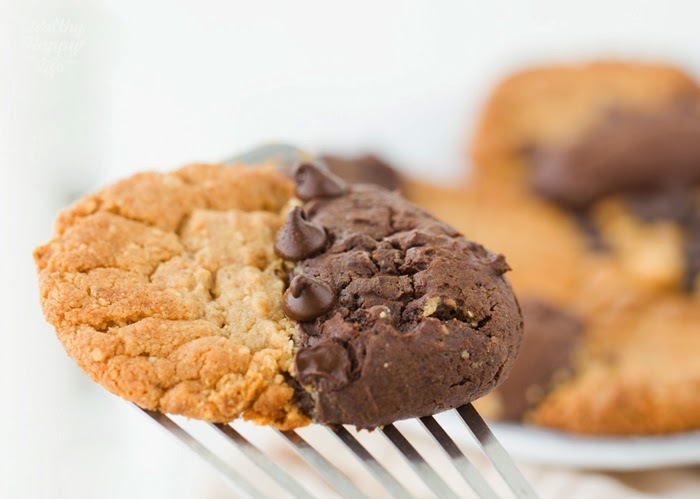 That is the best part about this post, you can take this idea and you can do half/half with just about any cookie recipe you'd like. The one tip I would give is to make sure the cookies "spread" at the same rate. And this usually means they should have equal parts fat (oil/vegan butter), flour and sugar. My brownie half did not spread as much as the peanut butter half, so my cookies came out a bit lop sided. But again, I cannot wait to try this technique again. So to correct the lop-sidedness, next time I will use a basic base batter, and make slight modifications to make the flavors/colors/textures different. Like subbing in some cocoa powder for the flour, but keeping the peanut butter in both doughs. Or subbing all vegan butter for all peanut butter. But really, these tasted amazing and are so fun for those of us who can never decide on a flavor. Next time I want to try three-flavors cookies! Ps. 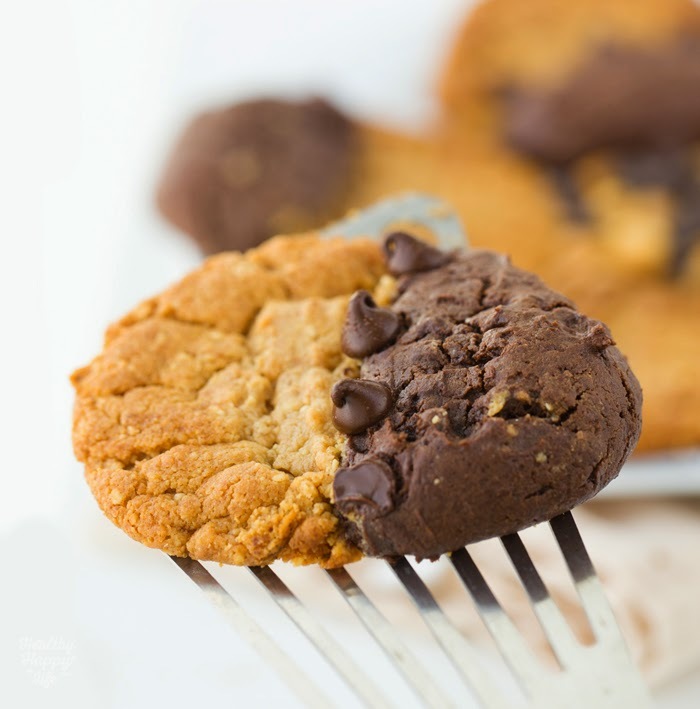 some photo cookie goals (only veganized..) - half+half stack. after .. uneven spread, but still delish! Maybe you can do better. Let me know. 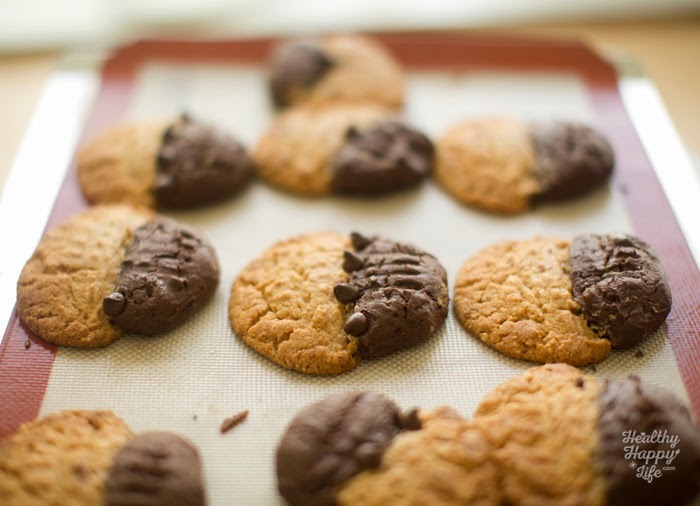 Testing out a new recipe for half and half cookies, these may not be perfect in shape, but the flavor is spot on. Rich, dense brownie paired with nutty peanut butter. First the peanut butter dough. Add the peanut butter, vegan butter, sugar, vanilla, chia or flax egg and cider vinegar to a large mixing bowl and stir well until smooth and creamy. Then fold in the flour, cinnamon and baking powder. When dough is formed, scoop out and into a small bowl. Place this bowl in the freezer. Now start on the brownie half. Add the cocoa powder, flour and baking powder to a large mixing bowl. Fold in the coconut sugar, vegan butter, vanilla extract and vinegar. 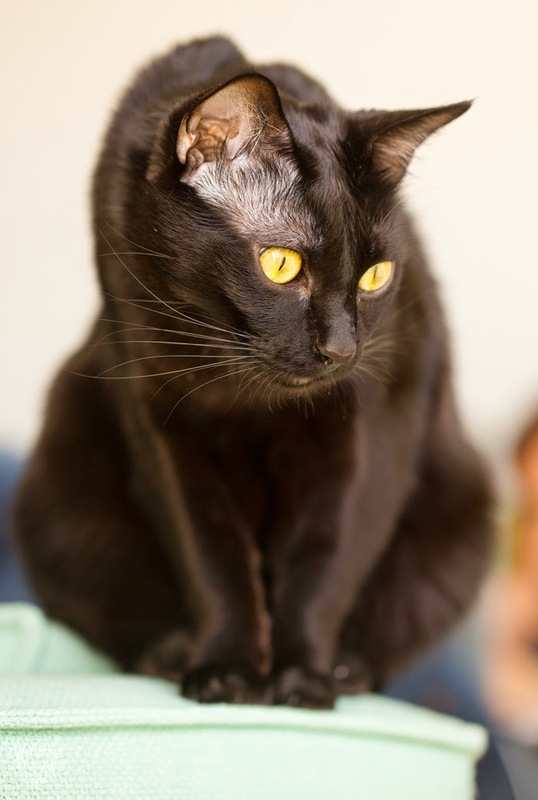 Fold until a very silky batter forms. 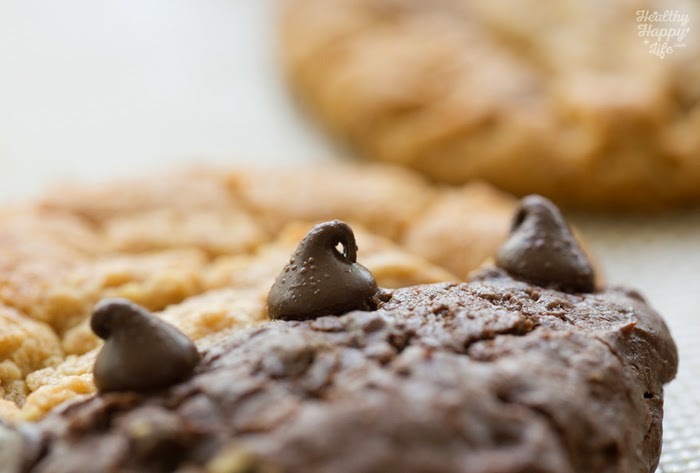 If your dough is a bit clumpy, you may need to use a blender or beater to smooth things out. Pour dough into a small bowl and place in the freezer. In about 15 minutes, remove the doughs from the freezer. They should be pretty firm by now. If not, leave them in for another ten minutes. You can either scoop or spoon out balls of dough. Roll them into balls in your hand or rely on the scooper for the round shape. I used my hands. Then take a butter knife and slice the balls in half. 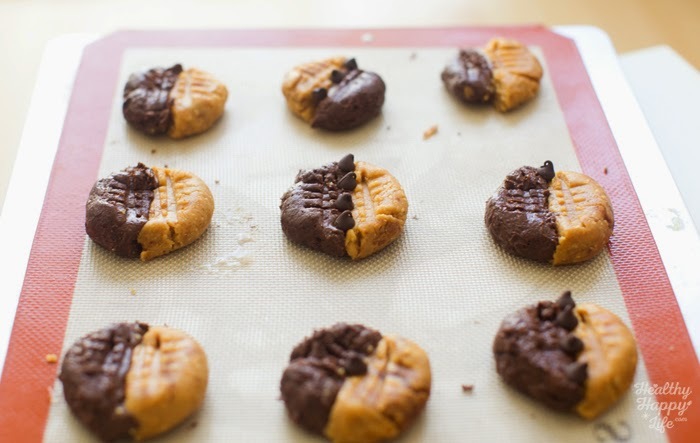 Place both halves on the cookie sheet. 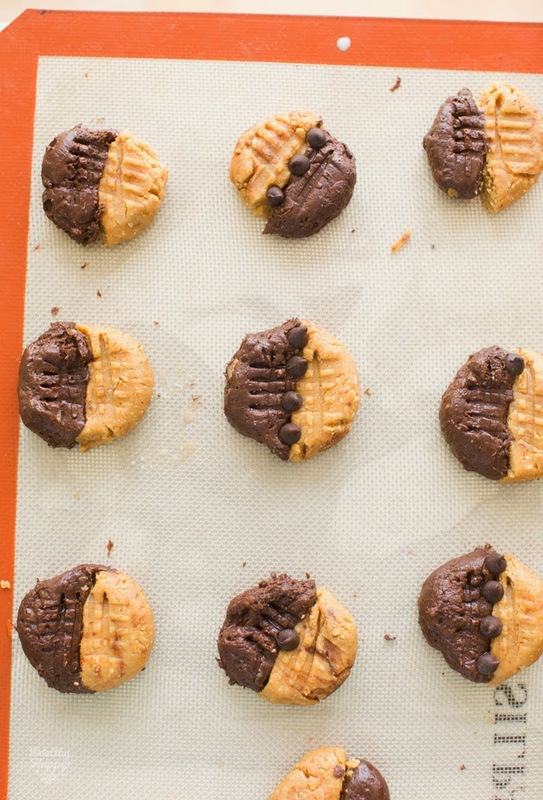 Repeat this process until all the peanut butter dough is used up. Then do the exact same for the brownie batter. 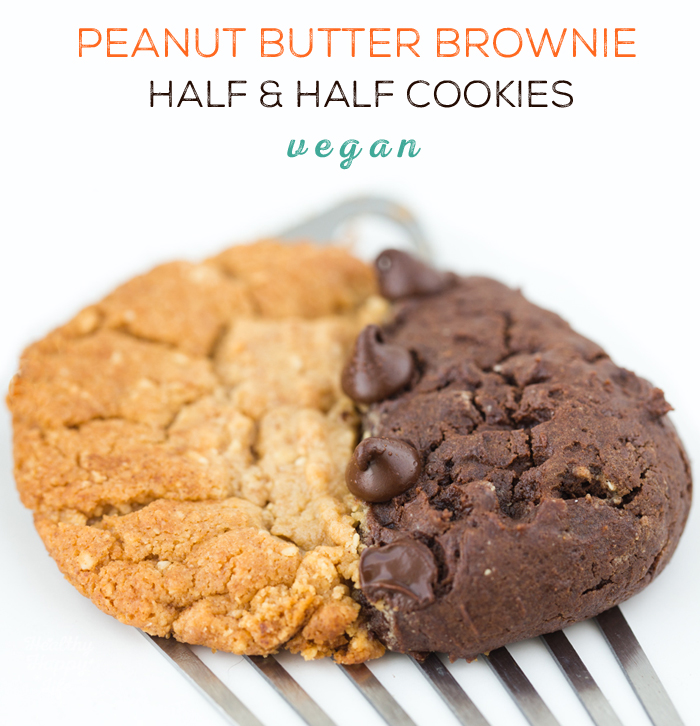 Scoop, slice and then pair the brownie half with a peanut butter half, pressing the two halves together. 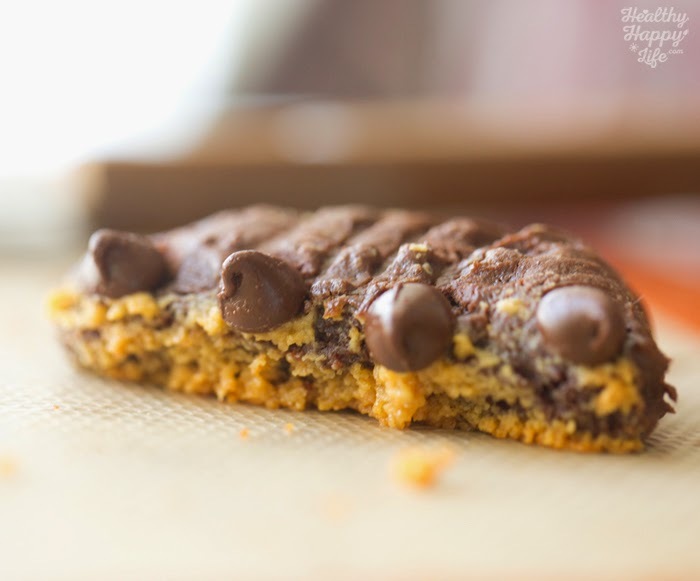 The brownie dough is a bit stickier than the peanut butter, so sticks quite nicely. 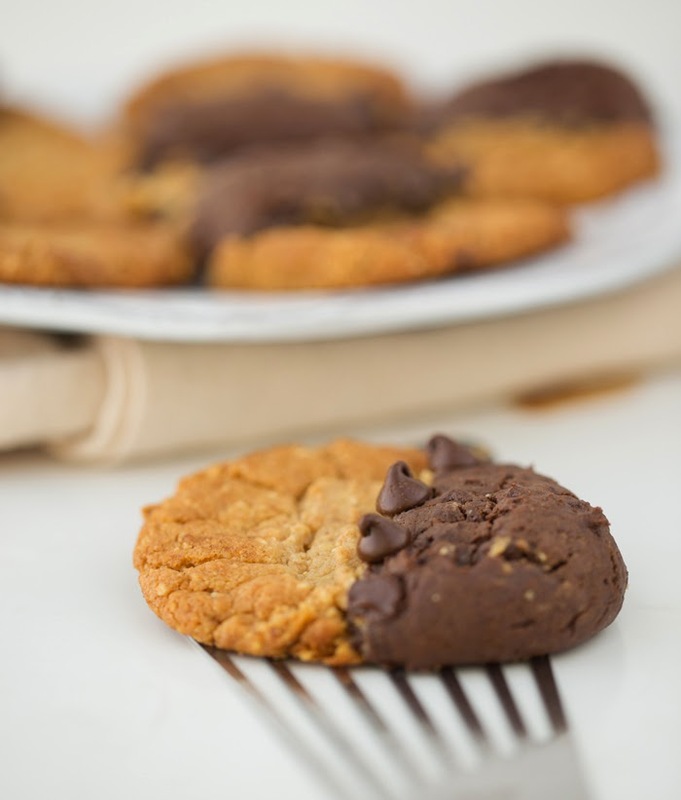 Next, use a fork to press down on the cookies, just as you might for a true peanut butter cookie. 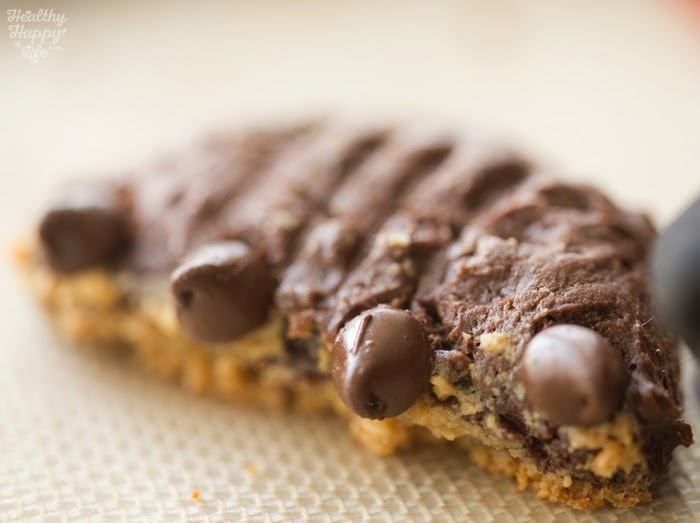 Add optional chocolate chips to the tops of the cookies. 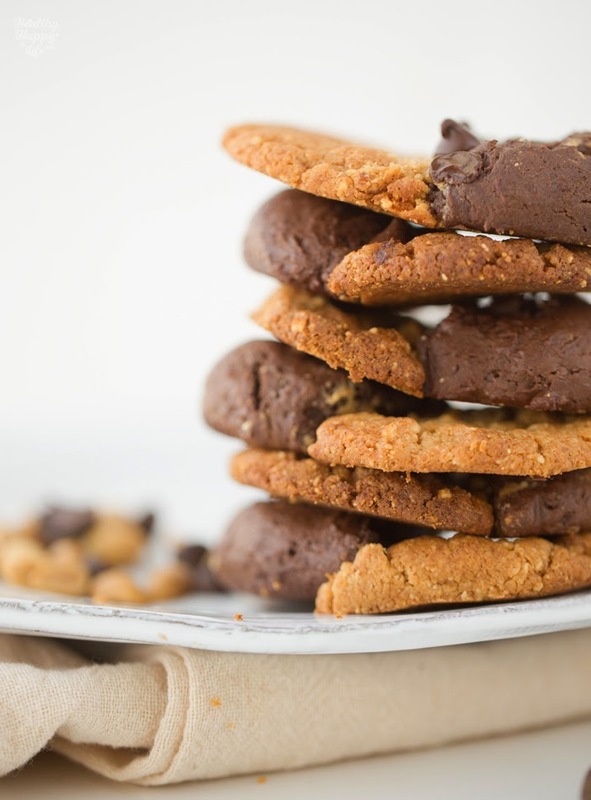 Use your fingers to press any loose edges together with the cookies. 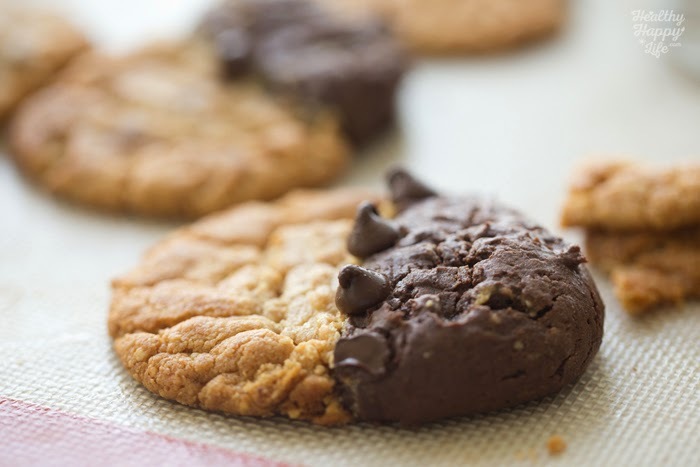 Bake cookies for 13 minutes at 375 degrees. Cool and serve. Cool well or the cookies will split apart before they have a chance to set. note: see note in post about possible changes, tweaks to this recipe.